I am a potter. I am in love with the material and the process. My practice and ideas evolve through making. My work is strongly influenced by the natural environment that I live and play in, with the various forms and processes associated with water composing a central, resounding theme. I am drawn to serene, fluid, and graceful forms, which I find abundant in vertical ice and water-carved rock. What fascinates me are the rhythms of freeze and flux, ebb and flow, erosion and deposition. My process engages these transformational cycles; the resulting dynamic surfaces convey a narrative of movement and change. Laura is a ceramic artist and art teacher. She creates her pottery at the Mud Studio in Middlesex, Vermont. I have been making animal sculpture for over 30 years, mostly with the subtractive method using a chainsaw and carving white pine, but working in plasticine clay to make models for them. Now, I find working with terra cotta clay a better way to express my love and admiration for animals and a good medium for permanence. Realism is my aim but sometimes it’s fun to anthropomorphize them a little to make useful items or just to be whimsical. Bears are universally iconic and comprise most of my work but every creature is unique and worthy of attention and I enjoy making special orders for people. I live and work in the backwoods of Warren, Vt near Blueberry Lake, surrounded by nature, and enjoy making music, carving, painting and rambling about. I design and hand build these one-of-a-kind birdhouses to be actual nesting boxes for various species of cavity nesting birds. The depth/width of the "house" as well as the diameter of the entrance hole is different for each type of bird. The stoneware clay that I use shrinks about 12.5% from start to finish so I have to scale all the measurements up to compensate for this. Every house has drainage, ventilation and opens easily for cleaning. 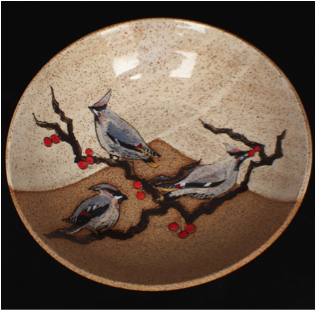 Drawing inspiration from her immediate surroundings Diane Echlin creates lyrical scenes of forest life on her large wheel-thrown jars and platters using her own hand-made clay stamps. 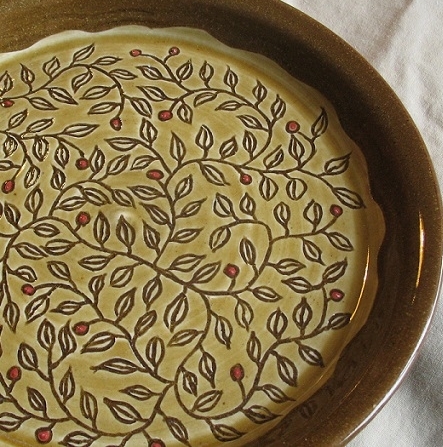 Her love of ceramics began at a very young age, and started her formal education in high school. Diane continued learning at workshops and classes at the Guilford Arts Center (CT) studying with artists such as Lisa Wolkow, David Frank, and Melissa Greene. She briefly studied with Michael Boylen at Marlboro College before turning her attention to other studies. She returned to claywork in 2013. Working in her home studio, Diane creates large format functional pieces, employing a multi-step glazing process to highlight the impressed scenes. She further embellishes her work with found items from the woods and beach, and with beads, crystals, and other items. I started my professional career as a graphic designer/illustrator, handdrawing and building camera-ready 'mechanicals' with an exacto blade and hot wax- until the computer made all that obsolete. I gave up paper, pencils and that wonderful handwork for the keyboard and screen. After more than 10 years designing on a monitor, I'd had my fill. I wanted to get outside and work three dimensionally. Using my art and design skills to create diverse landscapes, I built a design firm specializing in native plants and connecting people with their land. I dug holes, restored damaged properties and illustrated all my plans with pen and pencil. The seasonal aspect of landscape work gave me some down time, so I continued exploring the finer arts with oil paint and pastels, charcoal and (most satisfying) clay. Fast-Forward: We move to Vermont. My commercial ventures are past and this beautiful state inspires me to look forward to designing and building for myself, focusing on clay as my medium. I love making small sculptural boxes, thick friendly mugs and especially interpreting the human figure, always using color and humor, and observing what happens when my hands meet the clay. I have been a student of the arts since art camp as a child. I attended the California College of Art and Design at Oakland, California. After my sophomore year I took a year abroad to apprentice as a glassblowing assistant at Tarrah Glass in Crete, Greece. When I returned to the United States I finished my art education at the Rochester Institute of Technology in New York. After graduating from college I moved to New Orleans and worked making Mardi Gras floats and as a decorative furniture and lighting finisher. After the turmoil of Hurricane Katrina, I decided to head north for the peace and beauty of the green mountains of Vermont. It was here that I found my passion in pottery. The pieces you see here were inspired by this landscape. I find inspiration for my work in the natural beauty of Vermont. I enjoy making well crafted pottery for everyday use. I am very intrigued in the unglazed "naked" method of firing raku pots. I am fortunate enough to own and run both the pottery studio and gallery as well as The Wilder Farm Inn Bed and Breakfast located in the beautiful Mad River Valley of Waitsfield, Vermont. "Figuratively obsessed!" - that's how Georgia Landau describes her work. She has been an artist and craftsperson for over 30 years, moving between paint, cloth, clay, and sometimes all three. Georgia has remained focused on the human form, using it emotionally, pictorially, or abstractly. Her inspiration comes from mythology, as well as the plant and animal life that surrounds her. Georgia reveals an affection for these creatures, which are essentially human, though they transform into part animal, part plant beings. "My creative inspiration comes from an interest in Mediterranean Pottery, the tiles of the Middle East and North Africa, and Japanese Ink Painting with its simple, yet elegant brushwork. Travel is a great inspiration for me and adds immensely to my designs and life as an artist." My background is in environmental science, and my affiliation with the natural world informs my artistic expression. N3 Pottery was born out of a desire to share that affiliation, and to pursue the seemingly endless array of creative possibilities that clay presents. I create handmade sgraffito decorated pottery from white stoneware overlain with colored slip or underglaze. The work is characterized by bold, graphic designs using simple harmonious color schemes of slip and glaze. The result is functional handmade art that you can hold, feel and use. N3 Pottery also has a line of wall-art that uses compilations of ceramic plates/boxes to convey the landscapes of Vermont. Raised in Colchester, Vermont, I have lived in the Mad River Valley for 25 years. I spend my days teaching at the local elementary school, and come home to relax by playing with clay, creating functional art for the home. My pots are made of high-fired stoneware, safe for dishwasher, microwave, and oven unless otherwise noted. I gather inspiration from the natural beauty that surrounds me here in the northern Green Mountains of Vermont. The joy I experience while playing with mud is enhanced by the knowledge that someone will live with and love my work, both for its functionality and its beauty. Artist Janice Walrafen creates handmade decorative relief tile, murals, and sculptures from clay in her studio in East Montpelier, Vermont. Inspired by her love and connection to the diversity and beauty of nature, she creates handmade one-of–a-kind and multiple tile by carving into moist clay, creating a subtle relief image in the clay giving it a dimensional and textural quality. I enjoy everything about the clay process. I love shaping the piece on the wheel, trimming, and carving designs. My sgraffito is done mostly free hand and therefore each piece is one-of-a-kind. 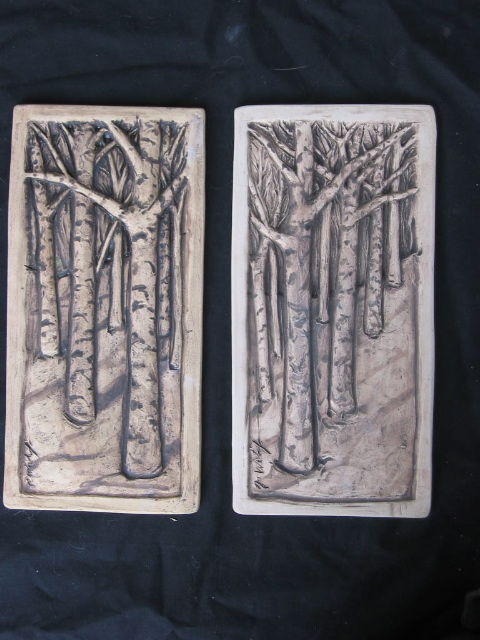 I enjoy the carving process for the boldness of the lines and the texture it creates in the finished piece. I had done pottery extensively in high school and college, and recently have returned to clay again at the Mud Studio in Middlesex. I worked for over 30 years as a lake biologist for the State of Vermont, where I honed these designs as doodles on the margins of meeting notes. I love the outdoors, and find much inspiration in nature for my designs. 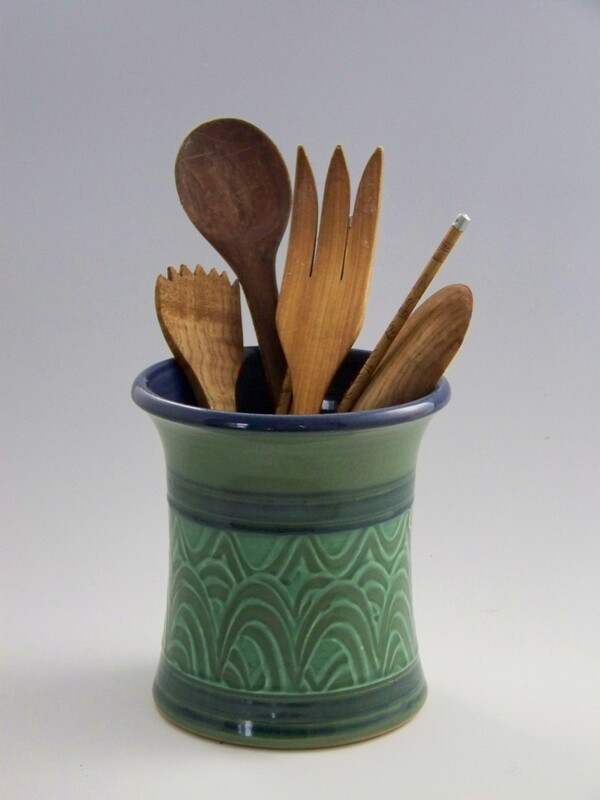 My pieces are created for use in the home and kitchen. Though making pots serves many purposes in my life, I mostly would like to think of them as a means of adding a little beauty to a world often stressful, complicated and fast paced. I suppose it is every potter’s wish that the pots they create honor our daily life. So when someone tells me, “I drink coffee out of your mug every morning. I love how it feels in my hands,” I can’t help but feel my work has meaning beyond my own need for creativity and inner peace. One of my greatest pleasures of being a potter is knowing my work will be used and enjoyed in the rituals of everyday life. I am a freelance artist living and creating in Waterbury Center, VT. I believe that art is a process of discovery and I thrive on working in a variety of mediums including painting, sculpture, assemblage and collage. Being from a long line of ladies who love to fish I became hooked on the sport as soon as I pulled my first bass out of Lake Champlain. Fish are sleek and lovely creature and their form lends itself to endless combinations of color, texture and pattern. I create my fish and dog sculptures using wood, copper, texture mediums, paint and found objects. Other inspirations for my work include&nbsp;Vermont's colorful people, music, animals and of course, pets.